This is another experiment with Cernit in the #1 line of colors all more opaque now! I wanted to do another “revisit the past” little experiment. I believe going back to old designs for myself, shows me how far I have come, a great design is a great design, always timely, and oh how I love this upgrade in the Cernit #1 colors, they are nice and bright in the new #1 line. No more of this is 50% translucent and this is a 100% translucent or 100% opaque to understand any more. The categories or color sections make so much sense now. All special clay colors are going to have a category now. 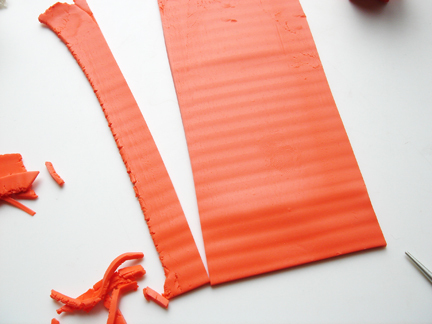 Making the color line in Cernit clay much more comprehensive. Still coming in to fruition. Sometimes things do get better. Sometimes companies improve things. Not everything is a marketing blizzard of less for more cost. Comments on pieces in pictures themselves. This first picture is a piece I made in the 80’s, it was part of a series I did and some of the first pieces I was selling retail in major department stores nationwide. 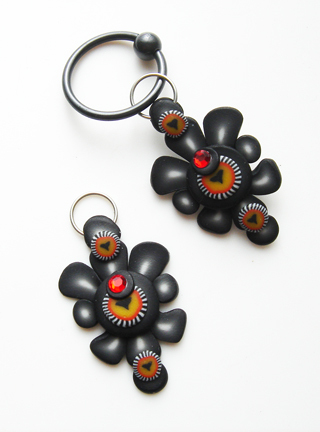 They were also some of the first pieces of millefiori to go major retail. I am proud of this line. 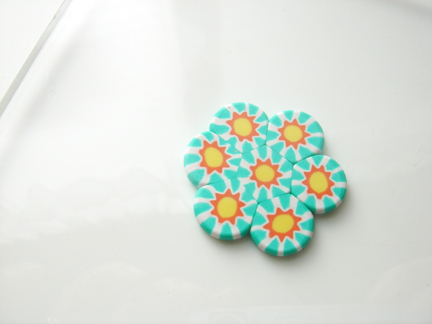 it comes from teaching myself caning or millefiori from a glass paper weight book. It was years of practice to get to this point. No information available at all, like there is today. 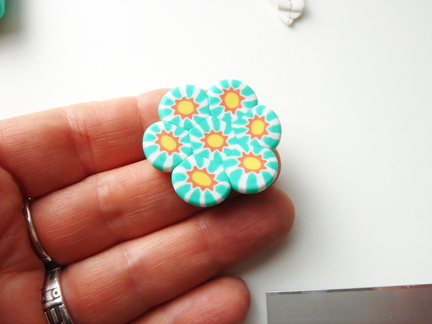 Getting these pieces in stores retail, was a step up for Polymer clay acceptance in retail markets. Some one had to do it. On a larger volume. At this time in my life we had several employees working for us at the time. Getting this in the stores upped our game on several levels. They were simple canes but effective and dynamic and not really seen before. New medium work, the one giant step for acceptance in the general public, is placing it retail in places like Nordstrom’s at that time in history. 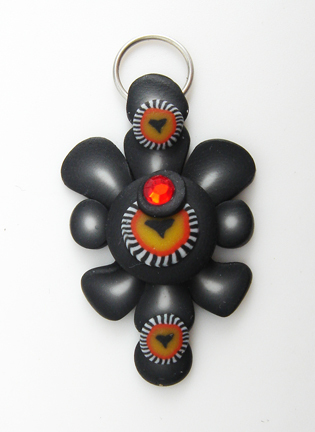 The original piece circa mid 80’s, color graduated series, all Fimo Classic. This is the next revisit, all new #1 colors Cernit, some canes the same, all a little more intricate now, but very similar. 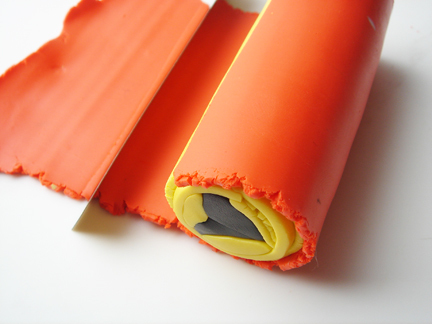 Colors loud and bright, the #1 line and all of Cernit clay canes beautifully, contrary to the old outdated opinion that it doesn’t cane well. Old news. It has been this way for years now. Still touted though by some that have never used it or used it in the last 15 years. The second piece in the second revisit! Pendant necklace All three together, top right hand side, old version. 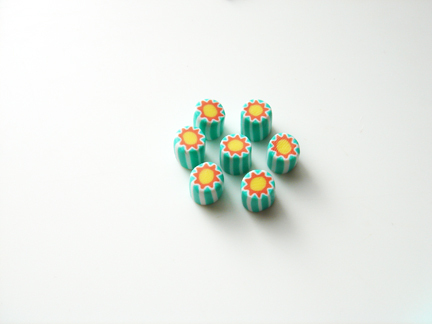 All the canes used to make the new versions. It takes a lot of different cane and I added a couple newer versions, but similar in colors and designs. Oh by the way, I love the new Champagne color in the #1 line, thank you so much for doing this. 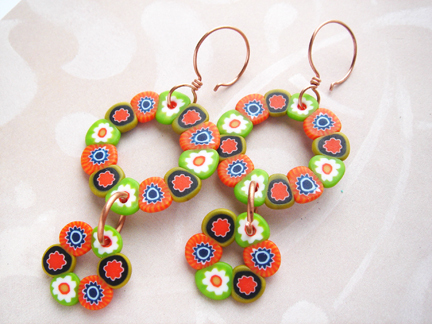 I am loving the newer take on this technique and design, with the beads you see on the left. I think there will be more of these. This my friends is one of the reasons you revisit old designs and work, you are in a whole different state of your art when you come back and things evolve from the paradigm that was set for you by yourself before. Level up anyone? I like them and the colors and couldn’t stop working in the pieces and canes I had made, this is usually a great sign for me. Just yummy! New pod action! I am really liking the elongated one. Pattern in sheet work, below my hand on the right side. These were first. I like them as well. 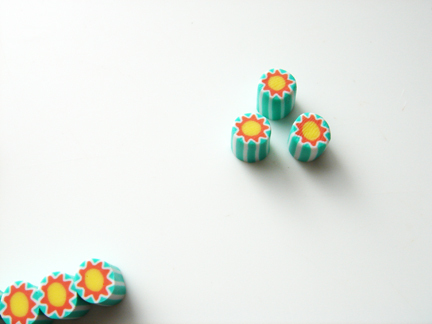 Set, I have to make another set of the fronts for the disk earrings in the proper color gold. I am loving the gold patterned mice shift insert on the brooch. Another view of all the canes and colors I was using. Shot in window light, with my iPhone. Not edited. wire that they would not rip anymore. He was right and they are good. up to the thicker wires they are heavier than standard ear wires. Mine are not that thick, they are heavier though. Well, I have been wearing these plain ear wires for years. 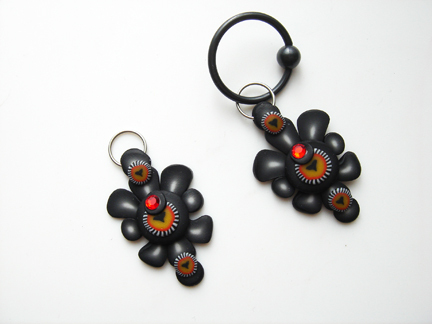 with the captured ball earrings. 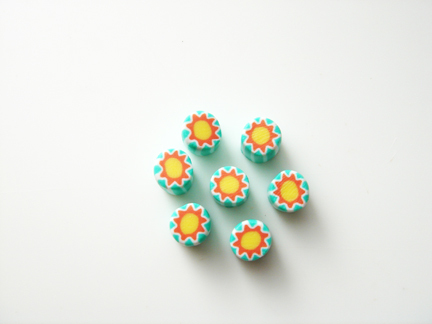 They 1 3/4″ high and 1″ wide. 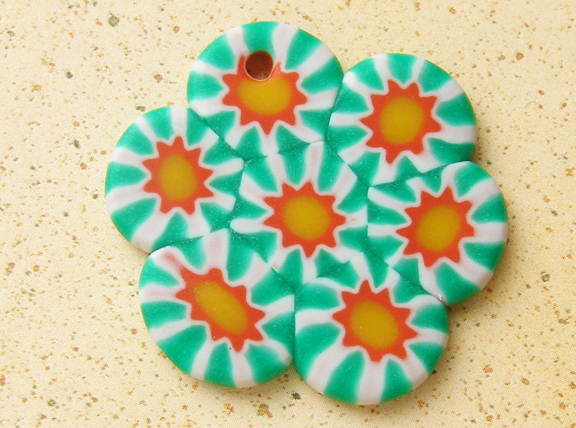 pattern with African Trade bead slices on them. They weigh less than the hoops. I am testing them out now! Mix all of the colors and the opaque white with equal amount of the porcelain white. 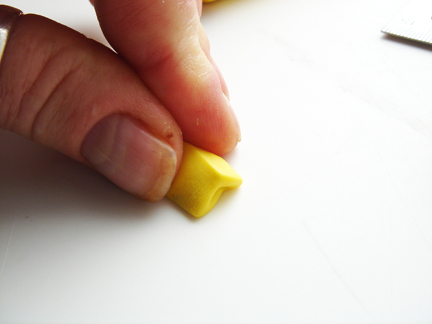 I go back and cradling the star in my palm I pinch the points on the star again to sharpen them up. 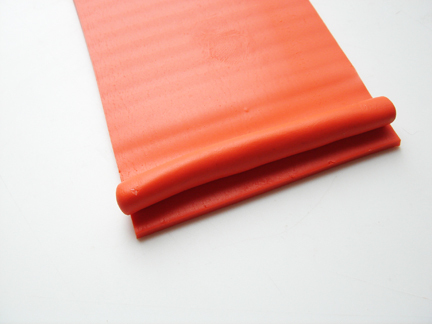 Roll out a sheet of the conditioned red that is long about 5″x at least 2 1/2″ wide. 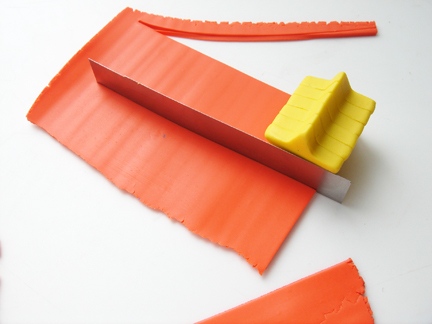 Trim for straight edges on three sides. 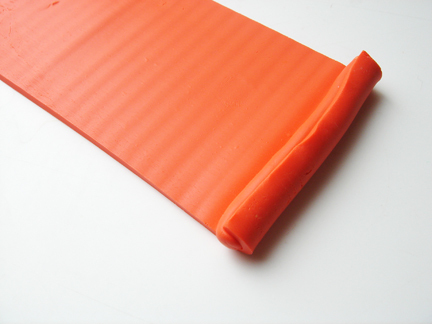 Roll out a coil that is about 3/8″ in diameter and the width of the sheet. 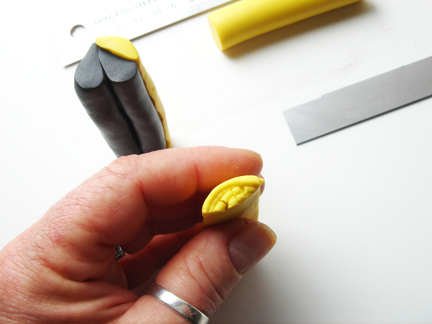 Lay the coil along the bottom edge of the sheet. 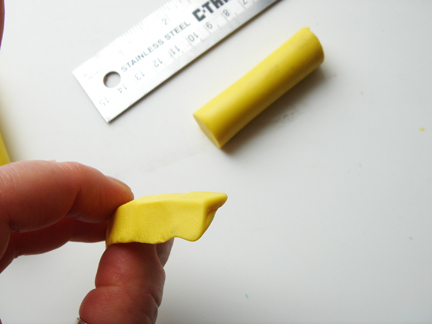 Roll up the sheet and the coil together to form a large coil of clay. 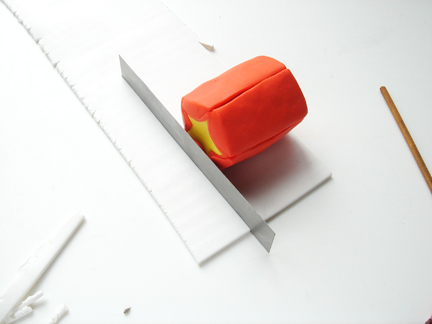 Trim off the rough edge and roll the whole thing up. 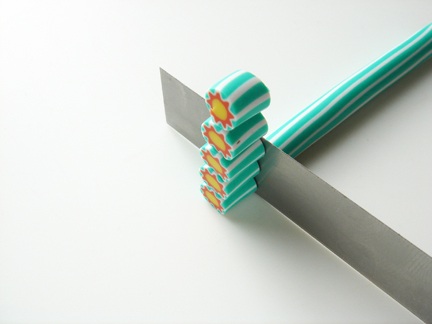 Roll the cane down until at least half or more fit in one of the dips between the points of the star. 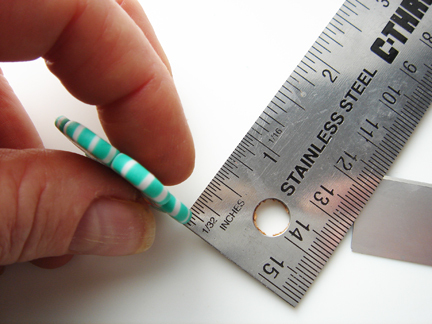 Measure it to the height of the stacked stars and cut one. I trim off one end of the red log so it will stand straight next to the star stack. Cut two more of those coils. 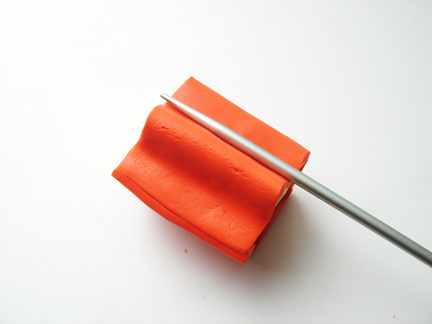 Press with your finger and thumb of one hand down and out on the coil and then using the clay slicing blade cut the coil in half. Do that with the other two coils too! 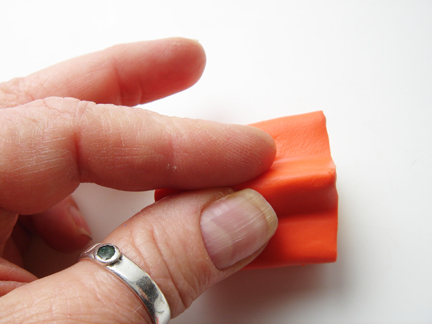 Make the coil into a triangle piece by pressing with your thumb and forefinger on top of the coil half, press straight down with your finger and thumb pressed together. It will look like this. Do that with the other pieces, you will only need 5 total. Place the point of the coil into the dip between the point of the stars. Place one in each dip. Stand the star up so you do not smash the points of the star. 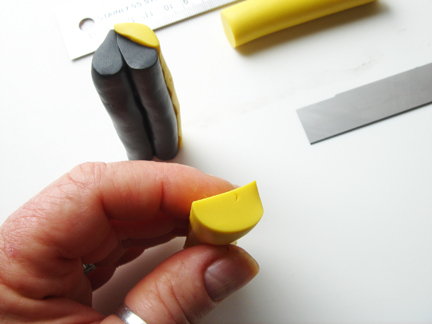 Trim off the excess length from the top of the triangle half coils. Place all of the coils before worrying about how they fit yet! 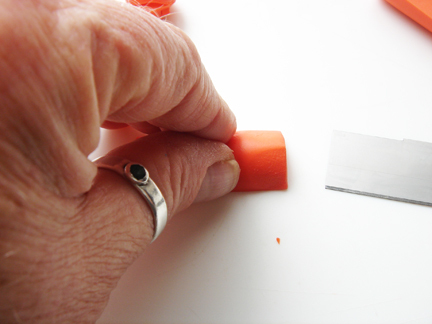 Place the last one in and trim off the excess from the top. Note* I cradle this in my other hand while press the two edges of the half triangle coils together. I do a little at a time on all of them and then turn the cane from end to end and so it again all the way around. I am only showing it on the work surface because I take the pictures by myself. Press your thumb towards your forefinger. 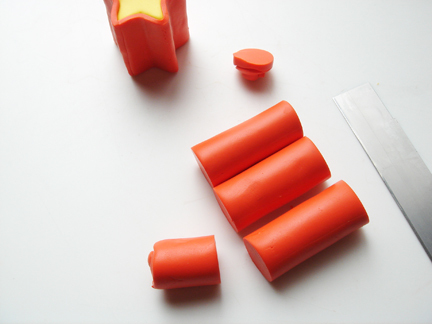 Here is what the star stack will look like after you have packed it. Don’t worry if it doesn’t look perfect from the end. 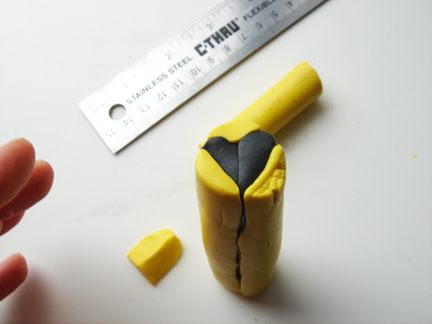 There is some distortion by pressing the clay and the ends will look funny but may not be funny inside. 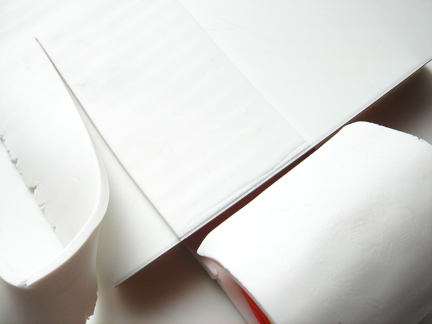 Condition and roll out a sheet of the opaque white. 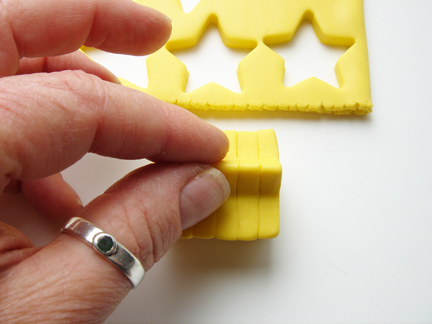 Trim the side to the star stack and the edge before the star stack. Now trim the other side to match the star stack. 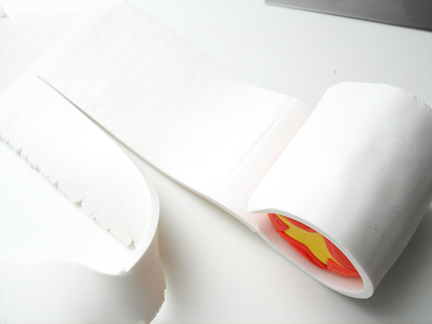 Roll the cane up in the sheet of white and roll the leading cut edge over the sheet on the opposite end to make a mark. 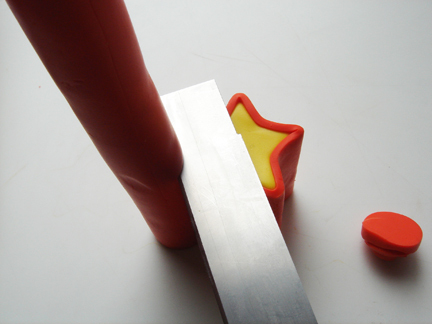 You do not have to press hard just enough to make a mark with the cut edge. Roll the cane up in the sheet and the edges should meet very nicely. Well, I figured it was about time for another African Trade bead cane image. 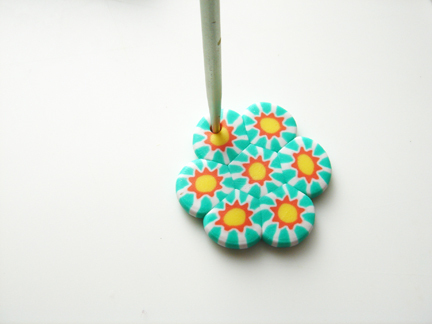 This one is unique because I am using a cutter to get the image and I am cutting wider stripy things to go around the out side of the cane. I could also see this cane in a circus, that is because the original cane that I took this from is just the star and the red packing and the white outline. I took creative license with the outside. 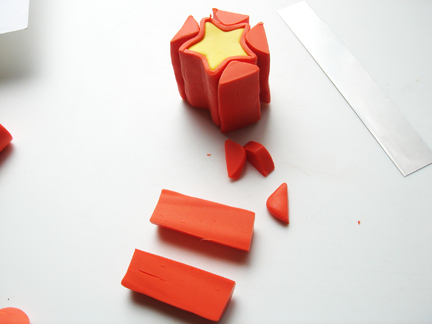 You can also see here how to make star canes, for the flag, for wizards, and for fingernails ;-O if you wish! 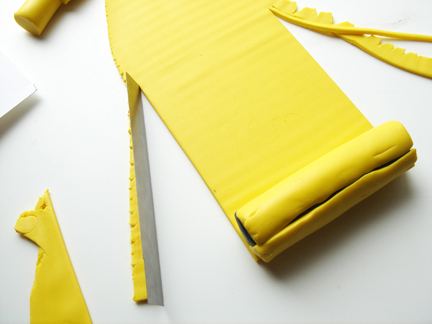 Condition and roll out yellow on the thickest setting in the clay machine. Fold the sheet in half to double the sheet. Press out the air. 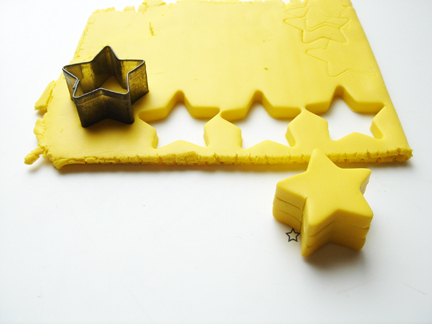 Using the medium star cutter in the Makin’s Clay star set. 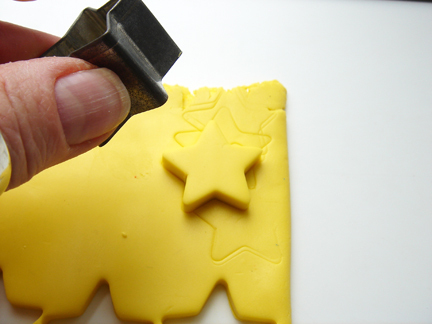 Using the seam in the cutter for a registration mark place the stars on top of each other. 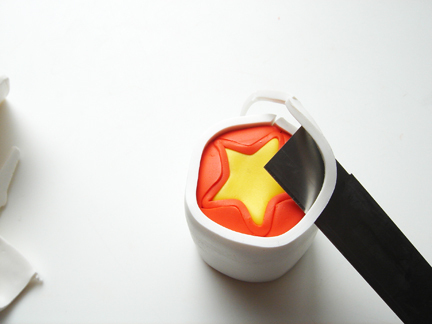 The seam will show on the side match that up every star you add to the stack. See where the black star is next to the star? That is where the registration place is. 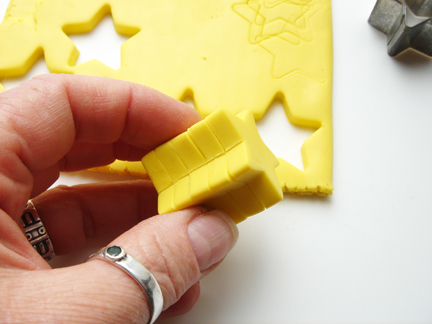 If you cut out the star and place the cutter with the cut out star in it on to a flat piece of the sheet. 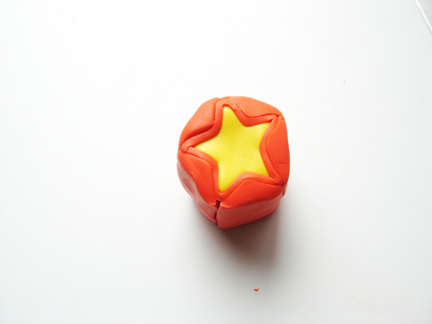 Pressing it down just a little and pulling back quickly you can get the star to come free from the cutter. 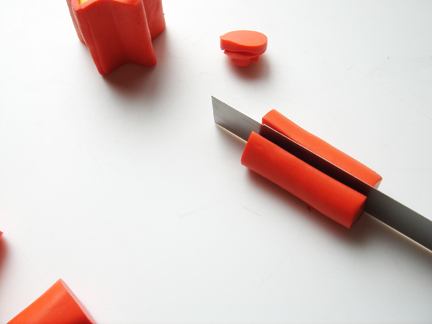 You can also dip the cutter in a little water, just the bottom cutting edge. Sometimes this helps. 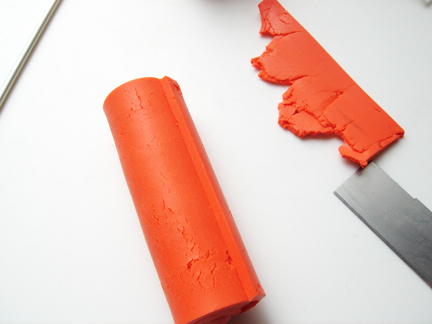 I know you can do that with Cernit, for other clays you have to make sure it works. 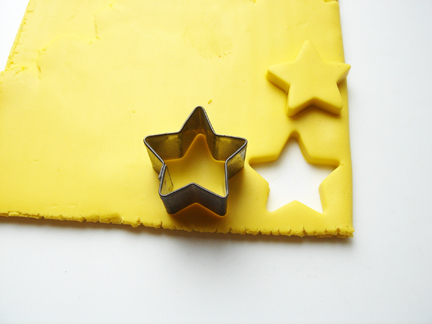 Dry the star on a paper towel. I have stacked 5 stars. 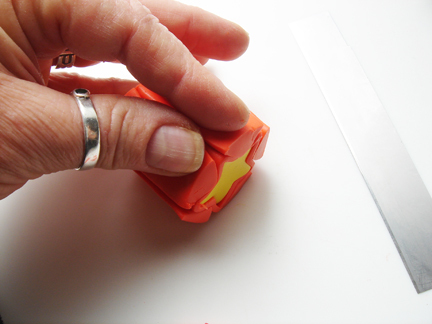 Press them together gently and then press the points together. I am making the points sharper for handling if they are out of whack. 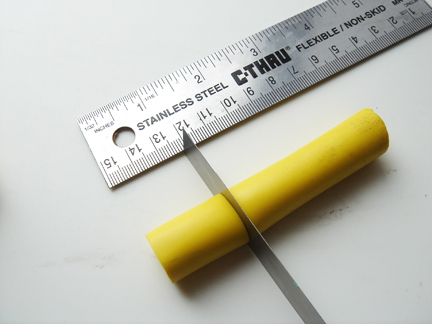 Trim for a straight leading edge. 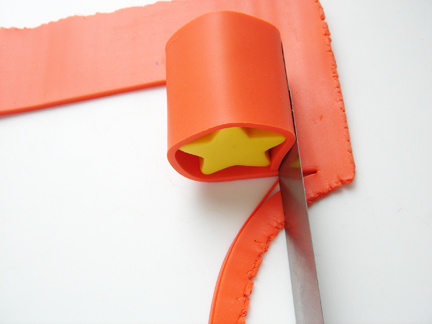 Trim the side to the star. Trim the other side do the sheet of red is the width of the star laying on it. 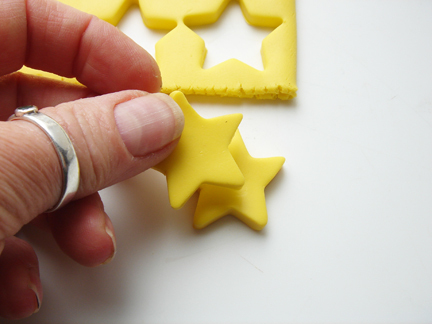 Wrap around the star loosely and trim off the excess so the edges match. I stand the star up on one of its faces and press in the sides of the red clay sheet in to the dips between the points on the star. 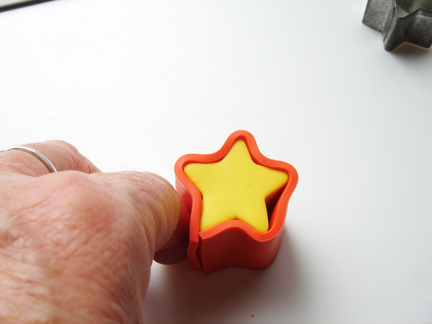 Cradling the star in one palm I use the knitting needle to press the sheet to the dents. I have to take the picture so it is shown on the work surface. 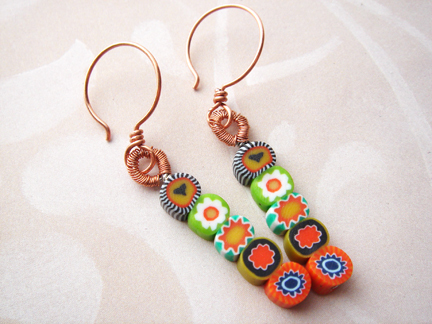 Is the winner of these earrings from Giveaway 9d the fifth giveaway! That is the final giveaway for this series. Of course unless I change my mind, it has been known to happen. LOL! Please get me your name and address JLaine you have 48 hours or it goes back to the draw. It is good to be santa! Have a great thursday everyone, blessings all over you! Congratulations Carol, get me your address so I can send them out to you! You have 48 hours to get back to me. And now to the rest of the tutorial. The supply list is on that post. Hope you having a wonderful week so far. Thanks for making me laugh yesterday. It felt good and I am so glad you are enjoying this. Cut half of the coil in half. 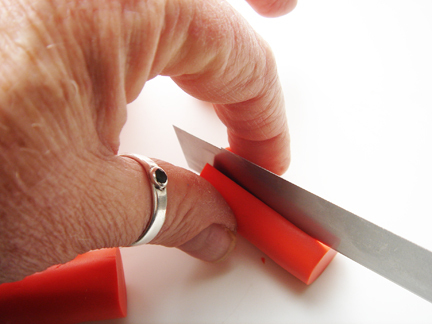 I push my thumb and forefinger down and apart on the end of the coil and slice through. 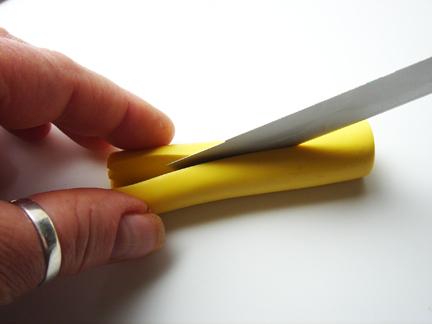 If I press the coil on each side of the end together, I will trap the blade there and it is hard to cut. This is the half of the coil. You are going to put the round side in to the dip of the heart above the point on both sides of the point. So I flatten out the rounded side of the coil and little and make the curve flatter. See the flat edge is curved slightly now too! Cut off another section from the coil you made in the beginning to do these coils. I cut off a little over an inch. Roll the coil out to about 3″. Press down to the table or work surface with your thumb and forefinger forming an upside down “V”. Press down the length of the coil. 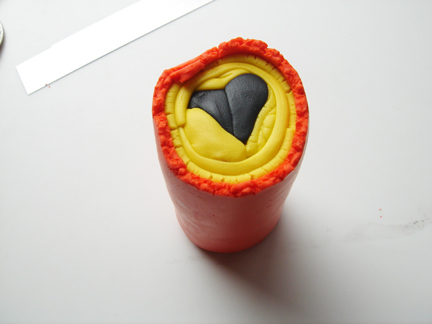 Put the point you made on the coil in to the dip between the upper lobes of the heart on top. 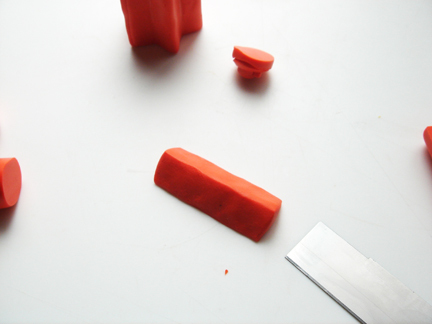 Then take the edges and flatten to the lobes or around them. 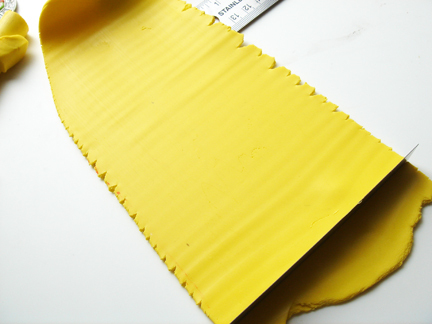 Roll out a sheet of yellow on the thickest setting in the clay machine. 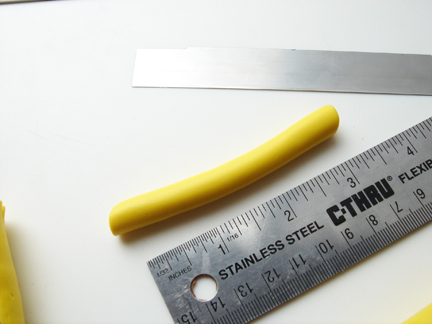 Cut off the leading edge for a straight edge to start with that is at least as wide as the heart cane coil center. 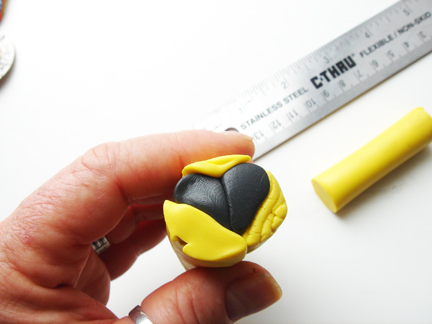 Trim it on the side so it is the same width as the coil is long. 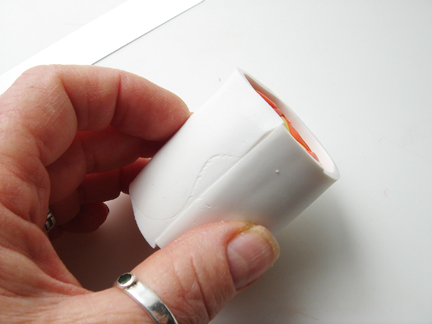 Wrap the coil and roll the leading edge over the other end of the sheet and gently make a mark on the other side of the sheet. 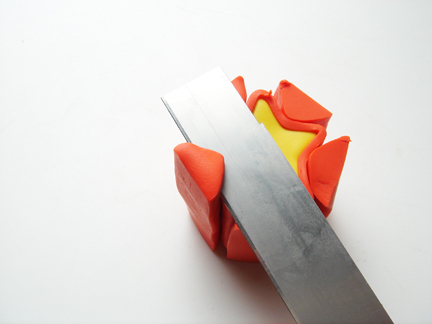 With your blade cut just inside that little line with the clay blade at an angle so the edges meet. 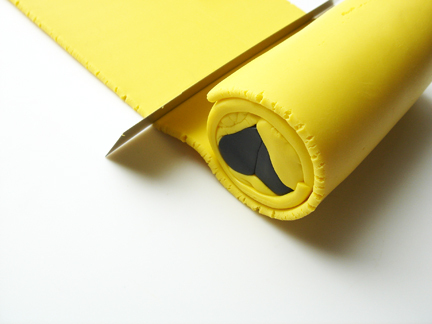 Cover the coil again the same way with yellow. 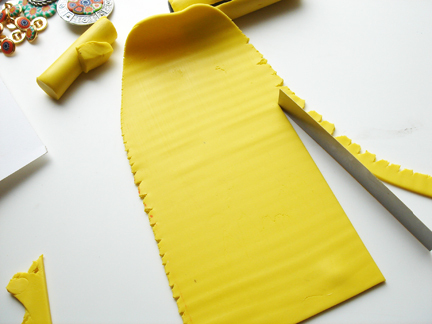 You will have two layers of yellow on the coil. 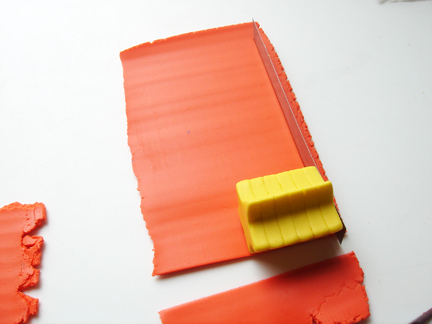 Cover now with a sheet of red that is rolled out on the thickest setting in the clay machine like you did with the yellow sheets. Here is the cane so far. I am going to stop here and continue this is part 10c. Sorry, but blogger starts to get weird on me with these long ones and it is so much easier to do them in parts. See you tomorrow and have a great tuesday!